This Mediterranean salad is good at room temperature and great served warm. Dried chickpeas are superior to canned chickpeas but they do have to be soaked, which requires advance planning. If you opt for canned beans, rinse well and skip step 1. Try this salad on its own or over a bed of arugula. do ahead All the salad components can be prepared up to a day ahead. Warm chickpeas and assemble salad just before serving. 1 Drain soaked chickpeas. Put chickpeas in a pot, cover with several inches of fresh water, and cook over low to moderate heat until tender, about 60-90 minutes. During cooking, remove any scum on the surface of the water. When chickpeas are tender, remove from heat and drain. At this point, you can allow the chickpeas to cool or keep going. 2 Combine red onion, garlic, red wine vinegar, salt and pepper and let sit for at least 10 minutes. Add to chickpeas. 3 Stir in red pepper and olive oil. 4 Over low heat, warm chickpeas in its dressing. Remove from heat. Stir in parsley. Sprinkle scallion and feta over chickpeas. Serve warm. 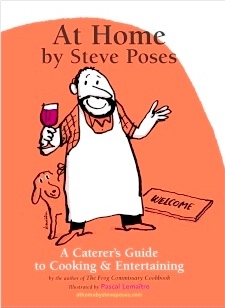 After yesterday’s detour to Holiday-Ready Brisket from Chapter 10 — so I could share a Rosh Hashana recipe in plenty of time for you to plan ahead — we return to our orderly countdown to At Home by Steve Poses September 25th shipping from our Kentucky printer. Today we visit Chapter 5: Tossed Salads and Dressings. Chapter 5 is part of Section 2, Getting the Meal. We recently visited Soups and tomorrow we visit Composed First Courses — salad-like recipes for things that lend themselves to arranging and plating as opposed to Chapter 5’s more casual tossing. Included in Chapter 5 are 11 tossed salad recipes, one spread on Mastering Salads that leads you through the world of salad greens plus six dressing in addition to the dressings that come with the 11 salad recipes. With a slight chill in the air in Philadelphia I decided to switch today’s Tossed Salad feature from a more summery Fatoush to this fall-is-approaching Warm Chickpea and Feta Salad. I guess if you’d like the fatoush recipe you’ll just have to buy the book. Of course, when you buy the book you will receive free access to At Home Online where you can also get the fatoush recipe — with an easy print feature — plus all the recipes in the book plus more. More recipes can be previewed at athomebysteveposes.com. In the early ’70s, people’s interest in food and cooking was growing. This interest spurred a cottage industry of traveling chefs who gave cooking classes mostly to people who were then referred to as housewives. One such chef was a little-known French practitioner named Jacques Pépin. His resume included long experience at noted restaurants in Paris and New York. In order to extend my education, I signed up for a class in duck at Julie Dannenbaum’s storefront cooking school. Jacques Pépin was an inspiration. He moved with the grace of a dancer. There was no wasted motion as he dismantled a duck and reassembled it into a collection of dishes that used everything but the quack. For an impressionable neophyte, Pépin was a model of professionalism, grace and creativity. Note: I will be speaking on the evening of October 15 at the Central Branch of the Free Library. Details. These disks of herbed savory shortbread are dressed with tomatoes and cheese. They’re delicious on their own and they also work well with other toppings such as tapenade or roasted red peppers. do ahead Shortbread dough can be made two days in advance, wrapped in a log and refrigerated. Shortbreads can be baked up to a week ahead and stored in an airtight container. Top them just before serving. 1 Make the shortbread: Preheat oven to 325°. Arrange rack on upper middle shelf. In a mixer or food processor, combine Parmesan, parsley, flour, salt, cayenne and butter and mix until evenly incorporated. Form the dough into a log 11⁄2 inches in diameter. Roll it up in plastic wrap and refrigerate until firm enough to slice. Slice 1⁄4 to 3⁄8 inch thick. Arrange on a baking sheet and bake for 17-20 minutes. 2 Make topping: Cut feta into thin slices, approximately the width of the rounds. Top each round with a piece of tomato and a slice of feta. Garnish with a rosemary sprig and serve immediately. If I had to pick only one cheese to eat for the rest of my life—God forbid—it would be aged Parmigiano-Reggiano. Produced only in the Northern Italian region around Emilia-Romagna and the city of Parma (anything else is an imitation), the cheese is made from raw cow’s milk poured into 100-pound-capacity wheels and cured to a moist and crumbly, salty and pungent nuttiness. I love a large nugget on its own or grated into soup or pasta, shaved onto a salad or served with fresh figs. Recently, we worked with a chef from Modena, a city within Emilia Romagna, whomade a divine Parmigiano “gelato” by cooking cheese and cream to a thick and scoopable consistency and served it on a nut bread with 30-yearold balsamic vinegar (see recipe on page 373 of At Home). Though there are plenty of paler parmesans on the market and the real article is costly, a little goes a long way and I find that this is an ingredient that’s worth the cost. Other excellent grating cheeses include Asiago, which is a bit sweeter, and pecorino, a sharper hard sheep’smilk cheese. Pre-grated cheese should be used only as a last resort. It’s best to pass a hunk of cheese and a hand grater and let your guests shave away salty filings to their heart’s content. They will be—pardon the pun—forever grateful.